Originally planned for a residential conversion, 31 Bond St. is now seeking a 74-711 Specia Permit for a change of use on the ground-floor and cellar to Use Group 6 . This use group allows for local retail use, not requiring high volume trucking service. The floors above will be for as-of-right office use. We have talked extensively with the owner of 31 Bond St., Sam Berg and his Attorney, Paul Proulx, regarding this application. They are willing to sign to a prohibition on restaurant use. The City Planning Commission will NOT, however, entertain including that prohibition on the property documents, so this stipulation will be good only as long as Mr. Berg owns the building. That said, the interior restoration of the building would make it extremely difficult for a future restaurant build-out. The offices above are all separate floor units featuring original brick walls (meaning nowhere to hide venting); the exterior rear wall has retained fire-escapes and the lot itself is fully covered by by the building (meaning side venting isn’t possible, either. We can ask that CB#2’s Zoning Committee request the stipulation on the property, in return for granting the Special Permit; it is likely to be ignored at City Planning, though. Should the building be sold and should a restaurant be proposed, it is highly likely that the application could be denied on the basis of license saturation and the fact that a license has never been issued to this address. 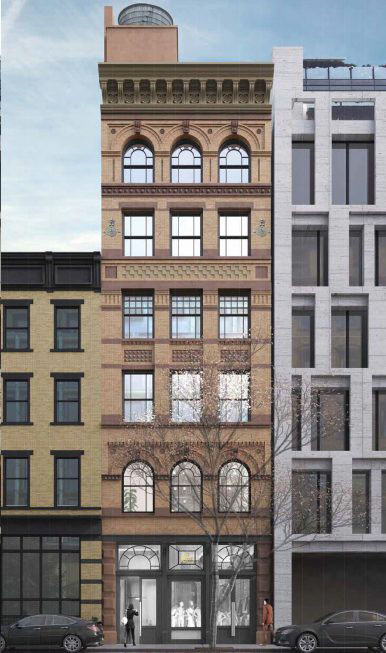 For residents on Bleecker proximous to the rear of this building – the exterior work has been completed, all remaining restoration will occur on the front on Bond St. and the interior of the building. You can see plans presented and approved by the Landmarks Preservation Commission here.